One of the products that impressed us most at CES this year was the Razer Mako 2.1 speaker system. It's a THX-certified multimedia speaker system, which represents the fruit of a collaboration between Razer and audio industry pioneer THX. The Razer Mako 2.1 is the first desktop speaker system to incorporate THX Ground Plane and Slot Speaker technologies, raising the bar for acoustic fidelity in desktop speakers. Whether you've connected your desktop computer, games console, television, Hi-Fi, or MP3 player as the Mako's input source, Razer claims the system will deliver sonic presentations that are the "best-in-class for any 2.1 desktop speaker system". "The advantage of multimedia and PC speakers is that they can be conveniently positioned on desktops and bookshelves. 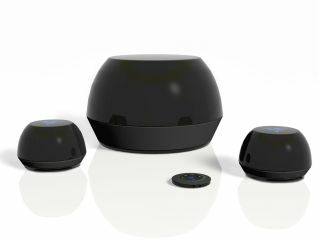 But, sound reflecting from desktop surfaces interferes with the direct sound, creating uneven frequency response at the listener's ear level," said Laurie Fincham, chief scientist at THX. "The Razer Mako 2.1 is the first multimedia speaker system designed from the ground up to provide optimal performance on the desktop," he continued. "The THX Ground Plane and Slot Speaker technologies ensure the speaker drivers are very close to the desktop surface, doubling the output and delivering smooth and even response at all frequencies." We were able to put the Makos to the test, and they really did sound fantastic for such a small system. They use patented THX downward-firing mid-range drivers and tweeters, which create a spacious soundstage that turns any desktop surface from an acoustic hindrance into an integral part of the experience. That may all sound a bit grand, but once you've tried them out next to your current 2.1 setup, you'll see what we mean. Certainly worth checking out if you're upgrading.